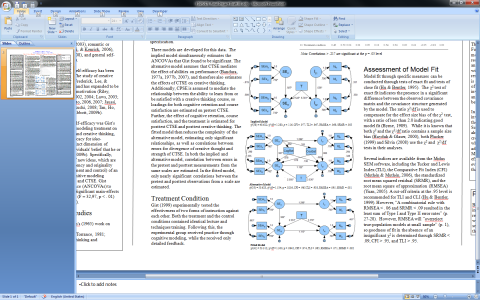 Microsoft Powerpoint 2007 SP 2 may be the best OpenDocument Presentation editor on the planet. I was editing a poster version of the final paper I wrote for structural equation modeling, and OpenOffice.org Impress was clearly having trouble keeping up. Â Happily, I was able to continue the work fine with Powerpoint, even pasting from my ODT-formatted report in OpenOffice.org Writer to my ODP-formatted poster in Powerpoint just fine. Between Office 2007 SP2, Windows 7, and Live Mesh, Microsoft is on a roll! Update: Slashdot links to another take. Apparently, OpenOffice does not properly follow some aspects of the OpenDocument standard, and other vendors have emulated OpenOffice’s behavior instead of the OpenDocument standard. This causes some problems. The first part of this sentence is not correct. OpenOffice.org does follow the specification with regards to formulas, and most of the vendors have settled on their formula language as the defacto standard. The ODF 1.1 specification does not describe a formula language (although it does give examples of a typical formula in subsection 8.1.3), and allows for multiple formula languages to exist under different namespaces. Microsoft is using this as an excuse to use the OOXML formula language, but their formula language is not compliant with section 8.3.1 of the ODF specification, which deals with how table cells are referenced. Thus the problem with interoperability is caused by Microsoft, not OpenOffice.org. Please also note that the formula language has nothing to do with presentations like those in Powerpoint, so the update seems strangely off topic. Interesting! Do you have any links where I could follow the technical discussion of this? ISO/IEC 29500 is the ISO-standardized version of Open Office XML. So, yes, Microsoft has publicly admitted to using OOXML formulas in their ODF 1.1 documents, but claim that it’s compliant with the specification because of the use of the word “Typically” in one sentence within section 8.1.3 of the ODF 1.1 specification. Supposedly, that one word results in the most of 8.1.3 and all of 8.3.1 being non-normative, and thus implementers can treat it as purely advisory. tdaxp, what Microsoft did is an attempt to discredit ODF and corrupt existing (correct) ODF files. Thank you for your comments! The technical articles were very informative. Hopefully the next draft of the standards will resolve these ambiguities.